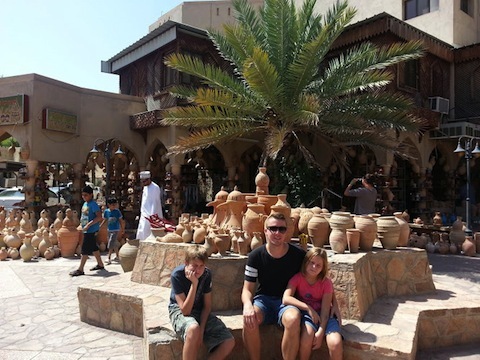 Last week was Eid-al-Adha break and we had a week off so decided to drive from Dubai and explore Oman. We drove from Dubai to Hatta and across the border to Oman and from there down the coastline to Muscat. It was a decent drive as they are building a new highway, which is finished in places but even the road works seemed well organized and easy to get around. The drive took about 5.5 hours and traffic was very light. We were impressed with the amount of greenery and realized why so many stores in the UAE sell fruit and vegetables grown in Oman; lots of farms. 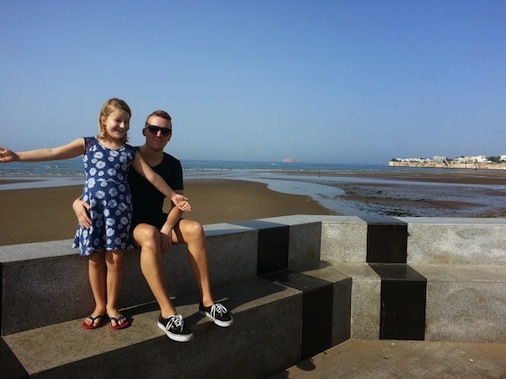 Muscat is pretty and very quiet – barely any traffic compared to the UAE. White buildings, blue ocean, desert, and then mountains made it almost have a Mediterranean feel. They have built an amazing Opera House and I wish we could have seen a show there, as the pictures look lovely. You can go into the lobby during the daytime but that is all. 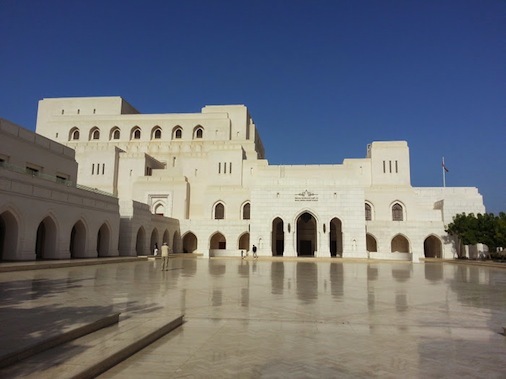 There are some museums in Muscat but overall it’s a pretty quiet escape. The beach is very open and wide when the tide is out and walking along the waterfront nice if weather is conducive. There are some restaurants just opening that have lovely views overlooking the water. We had a good sushi meal at Japonga for Jake’s birthday. Not cheap but nice quality. 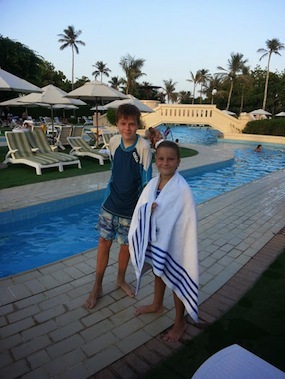 One day was spent at the Intercontinental Hotel with day passes for the pools. It’s not the newest but very nice to swim in cooled water pools and lounge on the recliners. Prices were much lower than Dubai for day passes (about $75 for four of us) to enter but the food was similar in price and beer of course very expensive. 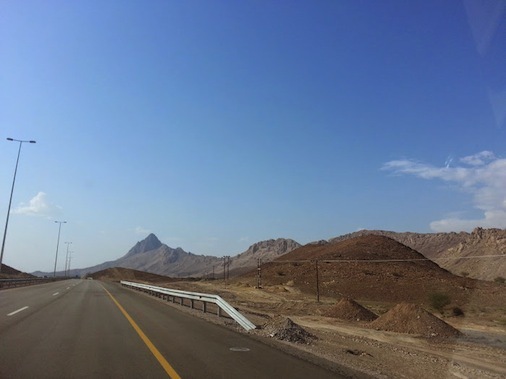 The next day we drove across the mountains to Nizwa and went to the fort and souk. The views of the mountains were stunning and we all enjoyed being able to go uphill and downhill again (not something we experience in Dubai). The scenery was very reminiscent of Southern California – Cajon Pass and Victorville etc. 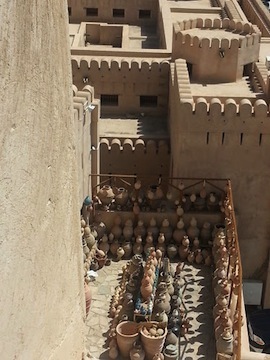 The Fort is interesting and we had a happy half hour there and same amount of time in the souk. Have to say, nothing to really hold attention longer than that. 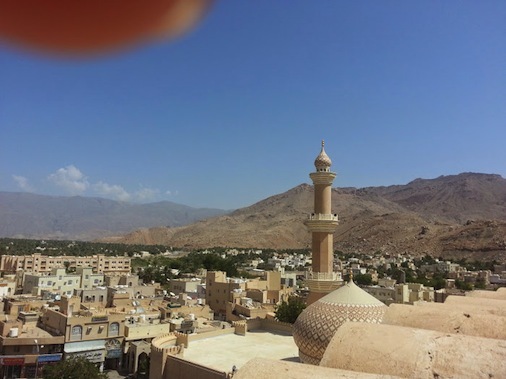 Nizwa is very conservative and not much to do. Sadly Bahla Fort and the caves we had planned on seeing were both closed and had been for a long time. This is a great area for winter if you want to go hiking wadis or rock climbing but other than that it is limited in tourism. 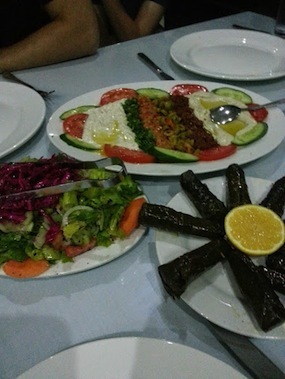 Our drive back to Dubai took us further inland and through more mountains and small towns (camels and goats abound). A really pretty and easy drive back to the Al Ain border crossing and from there it is about an hour and a half back to Dubai. It was fun to do a road trip again as we love those in the US but there aren’t really any options here other than into Oman. The longest would be to Salalah and then you run into Yemen. The other way is Saudi Arabia. So not really viable road trip options for a mom and her kids!